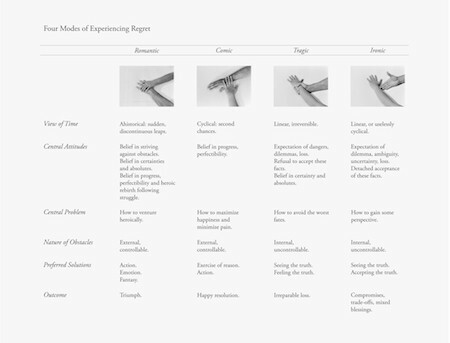 Four Modes of Experiencing Regret (2012) by Alejandro Cesarco. Courtesy the artist. Reaching the bookshelves wasn’t easy. Her sense of will returned only after a stretch of time having been lost in the universes of Stephen Hawking, which was itself preceded by a period submerged in the sound of slide-guitars. When Luz explained that, her situation, I pressed the rim of my coffee cup onto my lips. It was a reflex, to keep my jaw from dropping, to refrain from voicing any kind of expression. True, my eyelashes may have fanned from bewilderment, but I kept silent. Luz was serious. She said: To Hawking, I owe gaining a sense of perspective, to music, a regained pleasure for immaterial indulgence. She actually felt indebted, which, to me, at this day and age, that just meant being a common person. To her, it meant slipping out from solitude. She felt at a loss, and reparation lied in comprehension. I hadn’t seen Luz since last autumn, when tree leaves were one of several things changing color and falling out around her. Seasons change, fortunately. We were at Finn’s today, sitting at its outdoor terrace, enjoying the shade of its Tupelo. It was late in the morning, and our table was surrounded by those of overly-caffeinated people, whose eyes seemed to open wider at every syllable pronounced in their chatter. In comparison to their agitation, our conversation developed in slow motion, with lengthy silences between lines that couldn’t just be filled with pithy insights or common interjections, for we didn’t need to pretend transitions. Not that ours was a special kind of conversation and the others’ a babble. It was in fact a typical talk at Finn’s, to the extent that, like the rest there, Luz and I had our share of adventures, and we were meeting to see where they took us—to talk about where we were, in general. You may have actually been there, at that neighborhood café. You may know, then, that Luz had voiced a while back that she wanted to have no regrets; that, and to not regress along the way; to not repress nor assume a blank-slate in the process; that these were the personal goals she had set out to reach; that not knowing how to go about it, she recurred to literature; that I, from afar, accompanied her in the reading, partly out of empathy and partly because of experiencing spare, winter nights and long commutes. You may already know all what I am typing here, whether because you were eavesdropping on us this morning, or, quite simply, because you’ve experienced a similar situation to Luz’s. You may also know, then, that Luz and I were friends, even if I understood her far less than she understood me, even if I grasped regret far less than she. Regret is an emotion masked with hypothetical inquiry. It can have the appearance of thought; worse, of thoughtfulness; of critical consciousness. It’s not. While its arrival may be prefaced by philosophy’s what ifs that spark an exploration of becoming, regret instead menaces with a state of being. It’s a puncturing un-exhaled breath. It tightens the heart. A trip on a time machine gone eerie, regret entangles past, present and future. It’s all times experienced indistinctly in a single instance, sensed in synchronicity. With such time constraint, distance breaks down. It perils reason. Regret is ingrained to broken illusions, even if it may seem founded on the potentiality of dreams. It’s life at once felt and unlived. It aches in one’s muscles. It affects, and far from caringly. This is how Luz experienced regret. How she described it. And it was not a feeling she was at ease with. Regret had been a new sentiment percolating in her life, since her break-up last summer. Maybe regret had presented itself before. If so, Luz was probably as oblivious to it as she was insensible to the events that led to her separation. Acknowledging all this was complicated. Unburdening from regret was even more trying. Sure, Luz had a religious upbringing; catechism had insisted in the value of forgiving. Yet none of its lessons had dealt with regret; if there had been any sessions of such kind, these were clearly unmemorable. And sure, Luz had been privately coursed on identifying life’s turning points and missed opportunities, as well as in recognizing the significance of forgetting, the heft of shame, and the dexterity of pleasure, whether this was at church confessionals, psychoanalyst couches, or bourgeoisie cafés. But little did those exchanges address how to actually deal with that dreadful sentiment that is regret. I asked her: What about guilt? Luz had thought about it, and didn’t hesitate in sharing her conclusions, which were tentative, she assured me. This is where she stood on the topic thus far: While guilt and regret are both culturally relative emotions, and can feel similarly, their source and course differ. Guilt is rooted in the temporal terms of morality; regret is implicated in the spatial notions of subjectivity. Guilt is perceived to be seeded by an external force; regret seems to be concocted by an internal mechanism. Whereby guilt is imposed, socially instituted, regret is contrived, self-constitutive. In any case, the fact is that she noticed the symptoms of regret, not of guilt, and it was simply nauseating. Perhaps someone else has a more hopeful take on regret. Maybe you. Luz clearly didn’t, in spite of being generally optimistic. This ostensible attitude of hers isn’t transpiring between these lines, I gather, less so with that word choice: spite. I even notice a twinge in my fingertips at typing this word, all of them. Regardless of that, or precisely because of it, I’ve found how regret has been productive. It’s a sentiment much played out as the crux or floating signifier of sorts in a slew of novels, films, political discourse, you name it. Have also found how it’s been generative. It’s regret, again, what those various forms of narrative could instill; what would seem to be elicited at their experience. In these musings, I’ve wondered if regret is in itself an intended predicament of the culture industry. Have even made up a pop-theory of such complot. I shared it with Luz. She was unamused. As true as that could be, holding accountable an industry to such a feeling only displaced the problem, distracted her from the life-course she wanted to take. The first two titles that Luz read were Portraits of a Marriage by Sándor Márai and Woman Destroyed by Simone de Beauvoir. These were not exactly the best choice. Don’t get me wrong. They are beautifully written. Its narrative literature at its finest. Their plots unfold naturally at the momentum of its consonants. Emotions develop even between punctuation. Their characters’ epoch and atmospheres, love or war torn at times, their environments, dimmed in light for the most part, are evoked in ways that imbue the space of its reader. But it was precisely the absence of a fourth wall of which Luz had grown accustomed in literature what she was probably yearning. While reading them, she sometimes found herself nodding at words, closing her eyes after advancing some lines, or simply deflecting her sight to the margins of the book. Let alone the grief felt in reading the protagonist’s reveries and their outcomes. It was even painful to turn the pages of these novels. Still, those two books were grounding. They helped Luz find or give words to emotions; helped her in comprehending these, beyond barely feeling them. At their conclusion, tragic to say the least, they made her realize and declare: ending that way is not an option. Luz must have voiced this out loud on more than one occasion, in what was then a moment of inexperienced loneliness. And this must have been the speech act paving the way to reading others—others beyond her friend’s or my own correspondence, for those epistolary exchanges acted more like sounding boards than volumes with words from which to learn about her experience of regret, about tactfully releasing it from her life. Evidently, my share of literature on weather patterns and climate change were irrelevant to her. Luz was interested in reading other types of atmospheres. Three other influential books for her were Houdini’s Box and Missing Out, both by the British psychotherapist Adam Phillips, and Why Love Hurts by the French sociologist Eva Illouz. These books analytically address the formation or lack of will, desire, and expectation in modernity, all of which in some way or the other informed Luz’s state of being. The first of Phillips’s is a biographical psychoanalysis of the famed illusionist known for his acts of escape; a treaty juxtaposed with case studies of various of Phillip’s patients where escapism, out of fear and deferral, among other reasons, is a mode of survival. In this back and forth between Houdini’s life, whereby his Jewish background and his family’s experience of exile is unpacked, and the patient’s own histories of behaviors and choices, starting with a child’s hide and seek trappings, illusion is not only a matter of trickery, but moreover the imaginary’s projection of ideals. No later having finished reading the book, Luz paused her never-ending travels. She needed to think, reconsider her itineraries, the paths to and ends of the so-called unknown she was apparently in search of. She wanted time to speculate on what that unknown actually was or is yet to be discovered; what the search over the destination meant; what informed and valued her once considered findings or the potential quests. She had spent months kept at home, in a sort of delirium, until Hawking and music came along, until she began contemplating and reading and thinking and feeling other emotions again. All the while, I thought, was Luz regretting lacking a partner, understanding, an opportunity? All of the above, she thought, but was she? It still wasn’t all that clear for me, as her separation was perhaps an unconscious though sought-out occasion for freedom. Sure, there was anyways a feeling of lack, plenty of that, paradoxically, but somehow Luz seemed to be missing the point, the core of her duel. Deprivation. What an ugly word. More so than frustration. Way more than regret. Notice how the private part of “deprivation” is squished between prefix and suffix, cut short of belonging, in itself impoverished by grammar. Pointing at this is not to claim the private as a matter of property, or lack thereof, but to attempt reclaiming intimacy’s pre-modern relation to privacy, notwithstanding the reality of late-modernity’s inequalities and its drives to tell. However, while lexicon could indeed have an agonistic parallel to the emotional production of meaning in culture, Luz wasn’t seeking the ways in which vocabulary suffered. As you know, her preoccupations were on emotions symptomatic of psychic suffering. This is why reading Why Love Hurts by Illouz was a breakthrough. The author uses a Marxist lens to look at the ways in which a perceived inequality in love impinges on social relations. Neither Phillips or Illouz are authors to be found in the self-help section of bookstores or libraries—even though, Illouz’s Saving the Modern Soul addresses this type of literature, another instance where she analyzes the “medical” framing of romantic suffering in our present. But their work certainly helped Luz understand her emotions, and get rid of the agonies of regret that had become evident with her break-up. To rid of regret all together she needed to imagine other scenarios, and narrative literature was again revisited. Clarice Lispector’s Near to the Wild Heart brought a sense of affection and lightness unbeknownst to her, in her, without disregarding emotional intensity, even in light of disenchantment. César Aira’s You era una mujer casada brought with it a renewed sense of awe and, most importantly, of joyful laughter in the face of absurdity, that little discussed but prominent feature of the lovers everyday habits, secrets, or fissures, which sum to intimacy. By this point, Luz also wanted to create and live other scenarios, enough of just reading or imagining them. And this happened, of course, for having or acting on desires was never her issue, fortunately. Although at times I’d say… Nothing. I’d just press the rim of my coffee cup onto my lips and reconsider my thoughts. Listened. Enjoyed our conversation at Finn’s. Witnessed. With lightness and awe is how Luz fell in and out of love again. This time, with no regrets; as all times, with intensity; as never before, embracing absurdity. Now, comprehending that intimacy and its couple, complicity, are created in other affectionate ways beside a lasting relationship. These added instances marked Luz’s coming of age. And, what else can I say? I suppose you may have known or experienced all this before. Clearly, Luz hadn’t. For sure, I haven’t yet, but there’s no rush. Seasons change, naturally. After No Regrets, a pamphlet recently published by n+1 that gathers conversations of women discussing the books that influenced them in their coming of age.